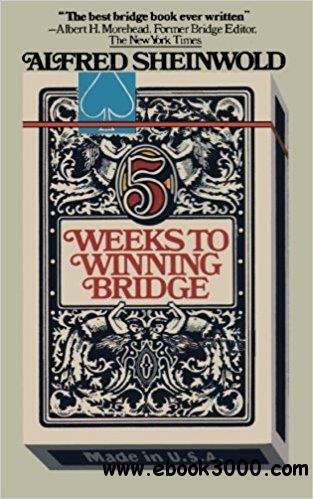 "Five Weeks to Winning Bridge" is the book most frequently recommended and most often read by beginning bridge players. It is divided into 35 chapters, one for each day of the week over a seven week period. Each chapter is about 15 pages long, enough for a new player to read and absorb in a day. Thus, at the end of 35 days or 5 weeks, the reader should be a competent bridge player. This book describes the Standard American bidding system. Although still the most widely known system, there have been a proliferation of bidding systems. The reader should be prepared to play under other systems. The reader should be aware that this book primarily describes Rubber Bridge play. Nowadays, most bridge play is duplicate. In spite of these developments, this book remains the one more players start off with than any other book. Thus, it should be required reading for all bridge players. If offers the clearest and most easy-to-read description of bridge.